Wow! That is so good! Such an interesting subject and you posed it beautifully! I love it! Fabulous banana skin Debra!! the inside of the skin and shadows are great . Wow! 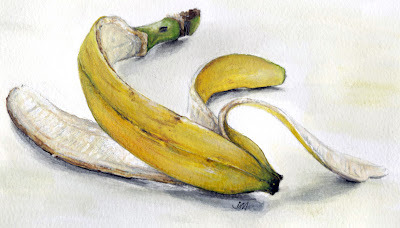 I've never seen a banana peel look this beautiful :-) Your sketches have always been fantastic. I would love to see what supplies you use. A wonderful work--amazing---what a great layout--beautifully displayed..perfect coloring.. This looks so real, the colours are perfect. A banana skin made beautiful! Excellent! All those little nuances of the peel....just perfect. This is so real looking, I think I could easily slip on it. I, too, would like to know what supplies you used. I love it! wonderful banana! Beautifully done - it looks so real! Fantastic work! I love the texture of the inside of the peel, and the colors. The shadows add so much dimension. wow - so incredible. I can smell the banana from here. That is a terrific piece!! Love your work, this one's impeccable! Very well done, Debra! The inside of the banana looks so real......everything looks real...fabulous! Love it! So realistic, yet painterly at the same time. Really like the diagonal composition, too. Well done! Fantastic Debra. It looks so real as you have captured the colours and textures perfectly. This is one of my favorite blogs. Thanks so much for posting your art.